Both Wayne and I are so delighted with the excellent dental implants you carried out for us. It feels so very natural and comfortable. Just as good as the originals. Mr. Johann Ackerman Reviewed by Mr and Mrs Sukowski on Our choice of The Ackerman Clinic was probably one of our better decisions. 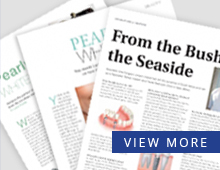 My wife needed implants to reduce the pain of recurring mouth ulcers but over the years had lost significant bone mass but Johann gave us confidence that he could help. The whole procedure was carried out with skill, compassion and importantly, friendliness, by all the team at the clinic. Johann even came to the clinic on a bank holiday to make a minor adjustment so that we could enjoy OUR bank holiday. Incidentally the coffee served by Fiona is excellent. We would have no reservations in recommending The Ackerman Clinic to any one that needs implants, or coffee. Mr. Johann Ackerman Reviewed by Mr Richardson on I have been treated by Johann and his team for more than 9 months. I have had 12 implants and despite some interesting complications (my medical history) everything has been completed painlessly, effectively and with the minimum of drama. The surgery was even open one night especially when I needed treatment. I cannot recommend this team more highly for their care and treatment. And he’s not a bad bloke either. Mr. Johann Ackerman Reviewed by Mr Fawcett on Very much a team effort, and what a team. This is Premier League stuff. The treatment I received had made such a difference to my life. Worth every penny! Mr. Johann Ackerman Reviewed by Mrs Thomas on It hardly seems that it was three years ago that I had my dental implants. The decision to go ahead was one of the best decisions I have ever made. Prior to surgery I had been suffering with mouth ulcers bought on by a poor fitting denture, which had been repaired so many times that it was no longer fit for purpose. The addition of a dental bridge, which continued to cause me pain, made me realise that I had some serious decisions to make. I had difficulty eating and had lost confidence in being able to smile in case someone saw my denture. I had seen the Ackerman Clinic advertised in local magazines but it wasn’t until I was driving through New Milton that I actually saw where it was. After prompting by my husband, I made enquiries and had an informal chat with the team and boosted by the positivity of my initial visit went again to the clinic for a formal consultation. It was then that I decided to go ahead. A week or so later my problematic teeth were removed and replaced with implants. 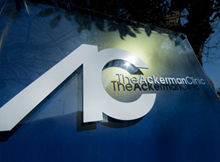 I have never looked back but could not have gone ahead without the full support of the Ackerman team who were very friendly and supportive throughout. I now have confidence to eat what I want and above all my smile has been returned. Thank you to The Ackerman clinic. Mr. Johann Ackerman Reviewed by Mrs O’Neil and Mr Pye on Yes – it is a HUGE thank you for the treatment you gave Dave but more than that – to see him at such short notice and at a time when your surgery was finished AND you where already changed for golf and ready to leave. ALL of which defines kindness and caring itself. Then ontop of ALL that not to accept payment was so very generous of you. A price could have been put on the treatment but the power of love and kindness you showed was priceless. God bless you, with heartfelt gratitude. Mr. Johann Ackerman Reviewed by Mrs Carthy on The Ackerman Clinic gives a feeling of complete confidence and comfort. Johann and his staff are superb. Treatment is excellent and well explained!